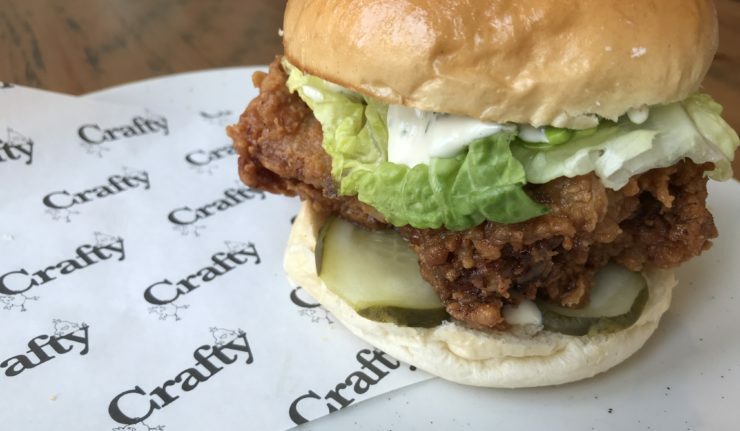 If you haven’t already heard, the team at Crafty Burger have taken over the kitchen at King Richard III on Highcross Street for 3 months with their new concept, Crafty Chicks. Yep, chicken, and lots of it! 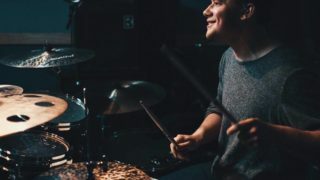 The menu offers a good range of options including both fried buttermilk chicken and also half or whole chicken barbecued on the KRIII robata, which we’ve already become such a fan of with their previous menus. Also catering for a range of appetite sizes with anything from 2 pieces of chicken, sandwiches and snacks to a whole chicken available. 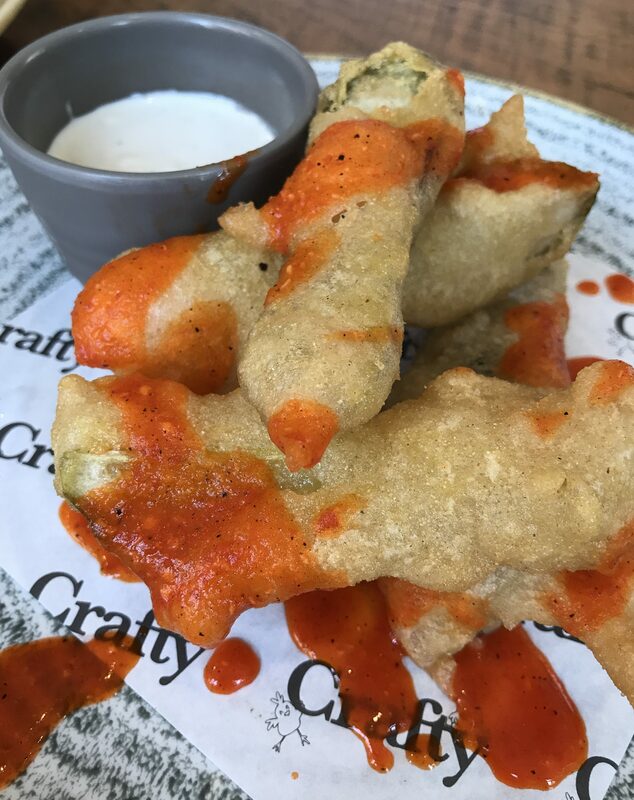 Out of the starters we were instantly pulled towards the fried pickles and weren’t left disappointed. Long thick slices of pickle were coated in a thick batter, that didn’t overwhelm them at all and wasn’t too greasy. They come served with a blue cheese sauce, which was a stand out side being made fresh with chunks of blue cheese in it. 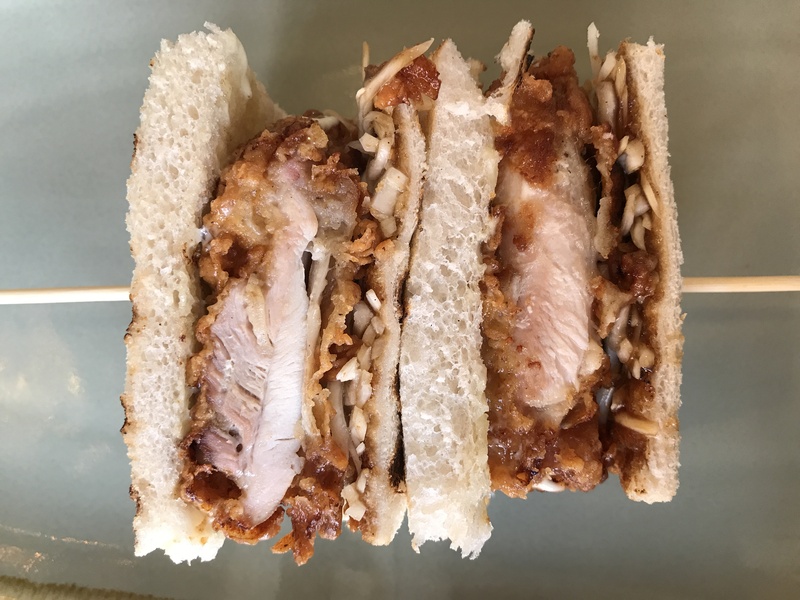 Next up came the Katsu Sando sandwich, which sounded mouthwateringly good from the menu description – “Panko buttermilk chicken, shredded cabbage, tonkatsu sauce and kewpie mayo served on white bread“. The sandwich is served on a skewer and each mouthful was utterly delicious. The crunch of the fried chicken with the shredded cabbage and the slight sweetness of the tonkatsu sauce only left us wanting more of it. My only complaint – it’s a little on the small side, but it’s only £5 so a perfect lunchtime option or just make sure you add on a side dish. Speaking of side dishes, they do Poutine! Which is fast becoming one of my favourite things, because what isn’t to like about chips, cheese and gravy. The Crafty Poutine consists of their skin on fries with chicken gravy and comes topped with pink pickled onion. It’s delicious so make sure you order a portion to share (or for yourself!) Other side options include the Cucumber Kimchi, Barbecued Corn and Chipotle Coleslaw amongst others. If you’re waiting to hear about something besides chicken, well don’t worry, as the menu states that all dishes can be made vegetarian on request with fried seitan and vegan options are also available. 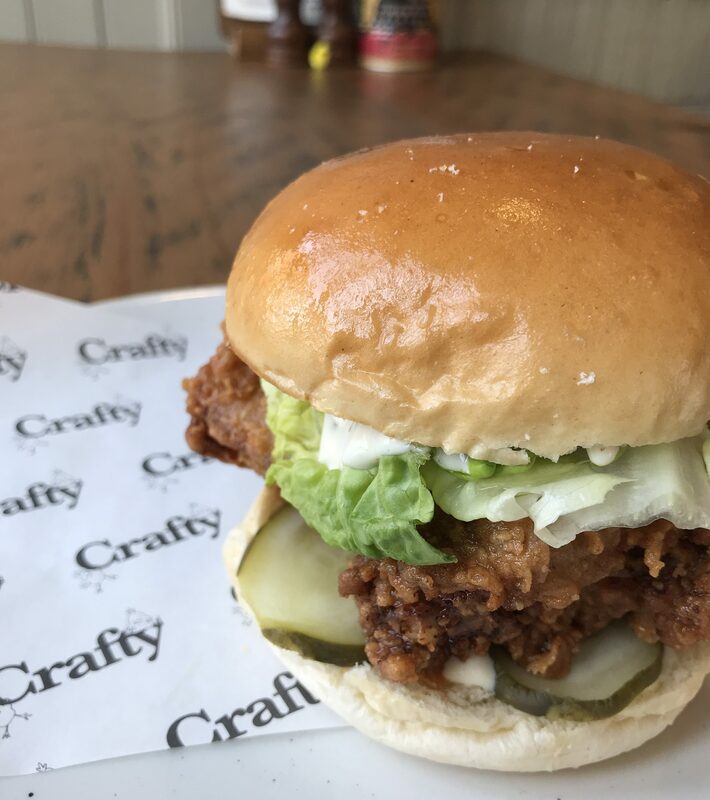 With special lunch offers and a kids menu, they’re catering for a wide audience and there’s no denying that fried chicken is certainly very on trend at the moment. If you’re familiar with either Crafty or the existing quality of the food at KRIII then you’ll be expecting this to be a hit, and you won’t be disappointed. 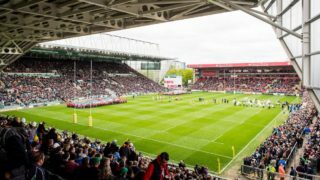 The restaurant scene in Leicester is incredibly competitive at the moment, especially in terms of casual dining. Surrounded by big chains as well as other independent eateries it’s a brave decision for the team to try something different, but we hope that it pays off! Crafty Chicks runs at King Richard III pub on Highcross Street for the next 3 months from 1 August. To book just visit the KRIII website. We visited Crafty Chicks on the first soft launch night. We paid for the meal and all views are our own.